My blog has very kindly been nominated for a Liebster Award! What is that…….you may well ask?! Well, it could be described as ‘passing on the blog’ a bit like the party game ‘pass the parcel’ ( for new bloggers or those with under 200 followers). Hopefully being nominated for this award, will help spread the word, bringing some new visitors. It is heartening to know your blog is being read, enjoyed and perhaps providing information and knowledge. I have been nominated, and therefore I am going on to nominate five other blogs. Hence the parcel travels! Thank you very much to Aaron and Nicky. I hope lots of you will go and visit their site and follow their travels around Europe in their camper van. They were actually in Norway at the same time as myself in June………perhaps they passed me as I was trundling along through the Lofoten Isles!! They have some helpful posts on their blog about the costs of financing their journey in the camper van and also posts about their workaway experiences in Norway. Read about their fantastic Greenland camping and kayaking trip, they really have had some memorable times and I am definitely envious of the freedom and time they have to spare. I think their blog is also a great resource for anyone else out there who has a camper van, and planning extensive travelling. If you need any encouragement or advice just click! It’s a well thought out, informative and unique blog…….impressive! Geoff has a great blog about travels by foot, bicycle or motor home. His posts are numerous and his images stunning…….he has a great sense of humour too……have a click! Chrissie writes about backpacking, wild-camping trips here in the UK and overseas. 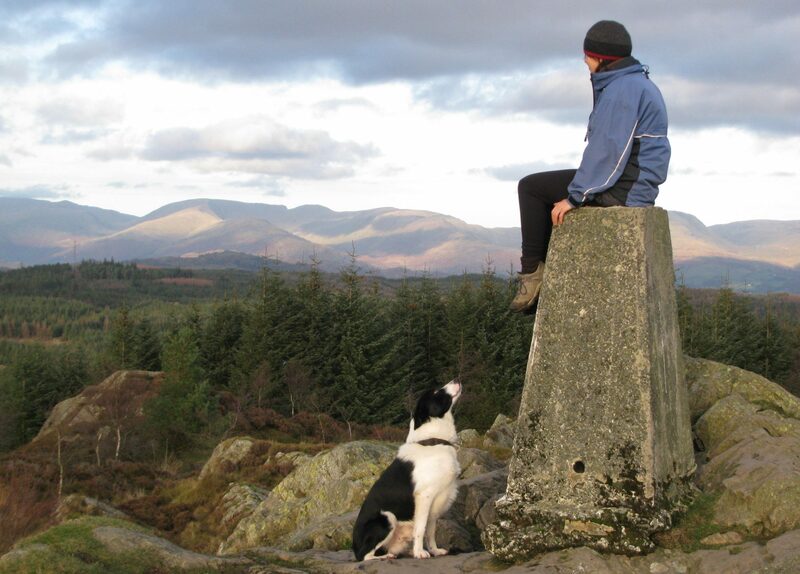 Also featuring Islay the adventure dog, who incidentally has his own blog! Awwwww! Jacquies blog covers mountain biking races and crashes, lots of gear reviews and she has won the Webtogs best climbing blog award 2015 ……..take a peek you won’t be disappointed! Matthew Kettlewell has a beautifully visual blog that covers adventures, hikes and gear. He is currently having a go at ultra running in a bid to raise money for charity…….go and visit him! I love eating rice cakes. Solo cycling is the best…….sorry to my friends……nothing personal! My house once nearly burned down. Swimming in cold water, even in winter is good for me! 6. I have a pet African Grey parrot. 7. My heroine is Mary Wollstonecraft, aka mother of Mary Shelley. 8. Most favourite writer is Robert MacFarlane. 9. Alcohol free……don’t like the smell or taste! 10. I once spent two nights solo, on a tiny patch of land in the middle of the Malborough Sounds, New Zealand………..scary! Which country, city or continent would you most like to visit and why? Bhutan is the country to visit for me……….still unspoilt, remote, mysterious and very beautiful. 2. What was the most inspirational time in your life so far? Probably when I retrained from State Education to become a Steiner Waldorf Kindergarten teacher. It was a time of true learning about the young child, my own character and the discovery of my creativity and public speaking voice. My two sons. Helping others in everyday life. Nature and the outdoors, whatever the weather. Keeping fit and healthy and respecting my body. The rights of animals. A very hard choice. Definitely one of Robert MacFarlane’s he writes so sensitively, poetically, and yet also in a down to earth factual manner. It has got to be, The Wild Places. Each time I read a section, it rekindles the fire in me to be outside, soaking up the mountains, air, sun, clouds, lakes and silence. 5. Your favourite time of year? Oh dear…..difficult but possibly Spring. Full of promise, vibrancy and freshness as the trees burst into bud becoming newly dressed. So much sparkling clarity, bird song and bustling around the hedgerows here in Cumbria. 6. What do you do besides blogging? Work to earn money! !…………Slow runs in the fells, cold water swimming, wild camping/cycling. Reading lots, to help towards my one day eventual e-book!! Listening to Leonard Cohen, Bob Dylan, U2, Joan Baez. Chatting with friends…….enjoying local music events. 7. Do you prefer the Beach or the Mountains. Actually both, as the beach or coastline is intrinsically joined to the mountains, especially in my favourite country New Zealand……….one becomes the other and vice versa! How can one possibly separate the two! 8. Where did you go for your most memorable holiday? This would have to be in my younger days…..age 26 to be precise. The infamous Yosemite Valley, U.S.A. to rock climb, and complete a two-day overnight route on the Leaning Tower. The second half of this holiday was spent following my kayaking partner, down the Colorado River through mammoth rapids at the bottom of the Grand Canyon. I was paddling a raft at the time………….exhilarating and terrifying………..just like the Yosemite rock route! 9. Do you prefer a sunny or rainy day? It entirely depends on which country I am in, and what I am doing at the time! A sunny day is always preferable in the UK as we don’t get enough sun, and a rainy day is best when I’m in a sun parched area on my bike! 10. If you had a day all to yourself where would you spend it? This is easy! Outside getting some exercise and doing what ever activity/journey fits in best with the weather or circumstances at the time……..wild camping too ideally. 11. What would you say has been the biggest challenge of your current lifestyle? Feeling constrained by working inside and limited holiday time……….and dare I say it living too close to tourism…………but it is about to change! Now here are my eleven questions for the owners of the five blogs I have nominated……..hopefully you will enjoy answering them! What is your favourite most meaningful travel quote? Where is the place you would most like to visit? What is the most exciting or scary challenge you have ever experienced? What advice in three sentences, would you give to a new blogger? What drives you forwards in life? Any unusual hobbies or interests? What is your best tip for saving money while travelling? Where have you had the best holiday of your life so far? Who from fiction would you most like to take on a journey with you? Navigate to the blog section and click on The Liebster Award graphic. Thank you so very much for reading………..here is one of my favourite photos of Xmas at Grizedale, Cumbria looking down the valley towards Satterthwaite……….. Previous postScary Nights of Stealth Camping!! Thank you Margaret…….and the same wishes to you! Thanks for the Pingback. Very clever how did you do that??! How fascinating Julie..well done for being nominated. Your post has almost inspired me to restart my blogging days again. Wishing you a wonderful festive season. Sending you lots of Festive good wishes too Therese. Pleased you enjoyed reading about the nomination…….go on restart….I’d love to read it! Thanks a lot for the ping back…….I need to learn how to do this…….good luck with the L A!